Santa's Candy Castle Airblown Inflatable. 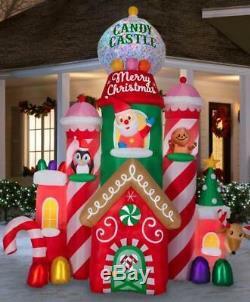 Make a singular statement with this colossal Airblown Inflatable Candy Castle featuring Santa, a few good friends and turning, swirling lights. Castle lights up and the top turns and swirls with Kaleidoscope Projection lighting. Makes a wonderful addition to your holiday decorations and yard decor providing maximum impact with minimum effort. Lights up for nighttime visibility. Self-inflates in seconds and deflates for easy storage. No assembly required: includes everything you need for quick setup and easy installation, including lawn stakes and tethers. Measures 10.5 ft H by 10.27 ft L by 3.44 ft D. Your satisfaction is very important to us. We will work out an arrangement to your satisfaction. We understand completely, and we will make it as easy as possible. 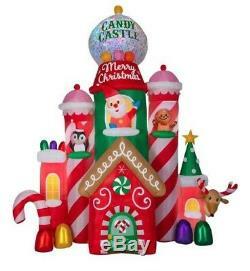 The item "10.5 Ft SANTA'S CANDY CASTLE Christmas Airblown Inflatable" is in sale since Friday, October 5, 2018. This item is in the category "Collectibles\Holiday & Seasonal\Christmas\ Current (1991-Now)\Yard Décor". The seller is "ukats" and is located in Flatwoods, Kentucky. This item can be shipped to United States.